Sgt. 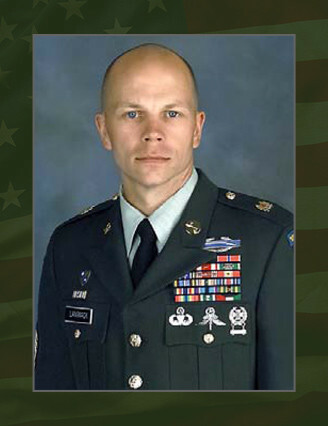 1st Class Steven M. Langmack was born in Seattle on Dec. 5, 1971. He enlisted in the U. S. Army as an infantryman on August 15, 1990. After completing Basic Training and the Ranger Indoctrination Program, Langmack was assigned to the 1st Battalion, 75th Ranger Regiment, at Hunter Army Airfield, Ga. After completing Ranger school in 1992, the young specialist moved to Washington State to join 2nd Battalion, 75th Ranger Regiment at Ft. Lewis. He was promoted to sergeant in June 1993. He served there until June 1994. He then moved to Fort Benning, Ga. and served as a reconnaissance specialist, a squad leader and a platoon leader at the Ranger’s Regimental headquarters. During this tour of duty, Langmack was promoted to staff sergeant in May 1996 and Sgt. 1st Class in March 2001. After graduating from the Special Forces Qualification Course in August 2001, Langmack was assigned to 2nd Battalion, 7th Special Forces Group (Airborne), at Fort Bragg, N.C. serving as a Special Forces senior communications sergeant until his reassignment to U. S. Army Special Operations Command in early 2004. Langmack is a veteran of Operations Desert Storm in Southwest Asia, Uphold Democracy in Haiti, Enduring Freedom in Afghanistan and Iraqi Freedom in Iraq. His military education includes the Military Freefall Jumpmaster Course, the Advanced Noncommissioned Officer Course, the Special Forces Communication Sergeant Course, the Survival, Evasion, Resistance and Escape Course, the Advanced Land Navigation Course, the Jumpmaster Course, the Basic Noncommissioned Officer Course, the Scout Swimmer Course, the Ranger Course and the Basic Airborne Course. His awards and decorations include the Bronze Star Medal, the Meritorious Service Medal (2), the Army Commendation Medal (5), the Army Achievement Medal (2), the Joint Meritorious Unit Award (2), the Army Good Conduct Medal (4), the National Defense Service Medal (2), the Armed Forces Expeditionary Medal, the Southwest Asia Service Medal (2), the Iraq Campaign Medal, the Global War on Terrorism Expeditionary Medal, the Global War on Terrorism Service Medal, the Humanitarian Service Medal, the Noncommissioned Officer Professional Development Ribbon with numeral three, the Army Service Ribbon, the Southwest Asia Kuwait Liberation Medal and the Kuwait Liberation Medal. Langmack was also authorized to wear the Combat and Expert Infantryman Badges, the Master Parachutist Badge, the Military Freefall Jumpmaster Badge and the Ranger Tab and the Special Forces Tab. He was posthumously awarded the Bronze Star Medal for valor, the Purple Heart and the Defense Meritorious Service Medal. His wife, Rachaelle, his two sons, Sam and Carson of Raeford, N.C., and his parents, Louise and Paul Langmack of Seattle, survive him.